In the year 1974, this dreaded poacher was caught with 680 animal skins, including those of tigers and leopards. In the year 1975, there was a seizure of skin of 35 leopards, 5 tigers, 2 pythons, 1 spotted deer, 1 Indian gazelle and 43 other animals from him. In the year 1988, there was a seizure of skin of 1998 jackals, 1004 jungle cats, 57 common foxes, 50 red foxes, 45 toddy cats, 25,800 snakes, 19 desert cats, 1 tiger, 5 leopards, 1 wolf and 180 wet jackals from him. 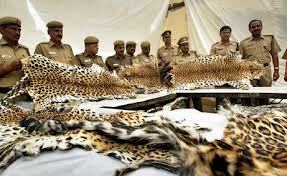 In the year 1990, there was a seizure of skin of 1 tiger, 17 leopards, 74 other animals and 30 kg tiger bones from him. In the year 1992, there was a seizure of skin of 31 leopards, 1 tiger, 1 tiger cub, 5 crocodiles, 8 jackals, 1 wild hare and 35 mongooses from him. In the year 1993, there was a seizure of skin of 43 leopards, 6 tigers, 26 tiger cubs, 6 black bucks, 3 fishing cats, 2 leopard cats, 3 clouded leopards, 3 lizards, 2 civet cats, 3 hill foxes, 3 leopard claws, 5 jungle cats, 1 jackal, 1 cheetal, 134 other animals, 4681 kg of sheep wool and 287 kg of tiger bones from him. In the year 1999, again there was a seizure of 1 tiger skin, 7 other animals and 5 traps from him. It seems this man was determined to wipe the whole wild life of India out in order to make money. Such murderers of harmless, innocent animals should be put in jail forever so that they can never harm animals ever again. Brutal killing of animals must be stopped immediately and all the poachers must be arrested and given exemplary punishment.